Trackmania: Build to Race is not a game for everyone. It's a racing game, but there are no other real cars on the road, and many of the races are over in under 30 seconds. There are other cars, but they are the "ghost" cars present in many video games, with preset paths and always the same finishing time. Also, as the name "ghost" implies, you can drive through them without any effect on your car. Essentially, what Trackmania boils down to is a full game based on the time trials mode you often see in other racing games. One of my favorite games of the PlayStation era is Rollcage: Stage II. To be more precise, the time trial mode in Rollcage, not necessarily the real racing (although that was good too, just not as compelling). In that mode, you're tasked with getting from Point A to Point B as quickly as possible along a plethora of twisting, turning, difficult tracks. And the faster you do it, the better rank you'll get. That is the goal. Each track has 3 medals to earn, depending on how fast you complete it. The bronze medal is relatively easy for experienced racing game aficionados, and likely doable for more casual players as well. The silver can often be achieved after a few tries and becoming more familiar with the track. The gold is a little more elusive, and often requires nearly perfect turns and memorization of the track. Since these tracks can usually be completed in well under a minute (the easier tracks often under 30 seconds), and since you're replaying the same track again and again in pursuit of gold, the memorization comes quickly, easily, and naturally. That's where the beauty of the game lies. In focusing on the time trial aspect of the game, the developers realized that players would need shorter tracks to be able to quickly memorize and improve their times bit by bit. Additionally, the goals are attainable with practice, and the controls are precise enough to allow for constant improvement. The ghosts can help you to improve as well, showing you a tighter line, how much to slow down to make that corner, etc. Many Wii racing games default to the Wii Wheel style of control: Tilt the Wii Remote left and right to steer. Longtime gamers who have played with this casual-friendly control scheme have often wished they could just have regular controls instead of forced motion controls. 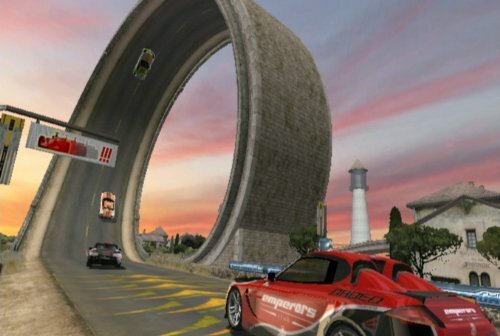 While tilt steering is an option in Trackmania, the developers knew that the type of gamers who would be seriously playing Trackmania would want more precision. The default Wii Remote control scheme is NES-style: D-Pad to steer, 2 button to accelerate. For even more precise analog control, the game supports the Nunchuk or a Classic Controller as well. My preferred option is the Wii Remote and Nunchuk combo. In addition to the time trial "race" mode, there is a "platform" mode which features much longer tracks that can take a couple minutes or longer to complete. These tracks are usually more difficult, and riddled with crazy jumps and other hazards that make it easy to fall off the course or otherwise get stuck. You can always reset your position to the last checkpoint, but that comes at a cost. In this mode, it isn't time that matters for your medals. You are graded solely on how many resets you use between the first checkpoint and the finish line. To get gold, you'll have to make it from start to finish in one go. Some of these tracks are just mind-blowing - racing at top speed down a straightaway, you see a ramp that ends at a 90 degree angle. Above it, a neon sign with arrows directing you to go left. So you approach the ramp on the right side, and start to veer left to get a good angle. You go vertical and to the left, slowly turning around until you're facing straight down, ready to land on a similar 90 degree ramp a hundred or so feet away from the one you just launched from, ready to zip through the next part of the track. Is it realistic? Not by any means, but it sure feels good to pull it off. This game is all about feeling good, and the soundtrack also helps in this regard. The music is composed by French musician Doo, and many of the songs sound and feel a lot like Daft Punk's Discovery album - really strong hooks with lots of repetition, this music energizes you to try for gold just One More Time (pun intended). There is also a "puzzle" mode, where you have a set number of pieces you can lay on an unfinished track, then you have to race from start to finish trying to get the best time. I'm honestly not as big a fan of this mode as the other two, but it's good for a change of pace, and will help familiarize you with the track editor feature of the game, which I'll discuss in a bit. There are by far the most events in the race category, but among all three categories there are over 160 to play and master. The box says over 200, so there may be some I don't know about, or I may have miscounted. One thing you might notice when playing is that the game looks good. Without any AI to worry about, and a very limited number of ghost cars on the screen, the framerate is nice and smooth. There are six varied environments: Stadium, Desert, Rally, Island, Snow, and Coast. Each has its own track types, and each has you driving a different vehicle best suited for those tracks. Each vehicle handles differently, but you get used to them pretty quickly since there are so few of them. There are several skins available for each vehicle for some customization, but no tuning for better performance. For this game, though, it works well. It's not about tweaking your car to maximize performance, it's about quick learning. You don't have to master progressively more expensive sports cars along the same tracks over and over. In this game you master the cars quickly, but the challenge is to master the tracks. The goal in multiplayer is similar, but instead of competing against the game's ghosts, you're competing against friends for the best time. In split screen, you race simultaneously on identical tracks, restarting as needed, to get the best time you can in about three minutes. Whoever has the fastest time for a single run when the clock runs out wins. In hot seat mode, the first player completes the track once and the game marks their time. The next player then goes and the game records their time. Then the next person until all players have posted a time. Then the person in last place goes until they get a better time than any other player, or until they lose (time runs out or they run out of tries, depending on the mode you select). As soon as they get a faster time, it moves to the new last place player and the pattern repeats until one player's time remains unbeaten, and all other players have lost. I actually prefer the hot-seat mode for a few reasons. First and foremost, the graphics and framerate take a slight dip in split screen. Secondly, there is an incredible tension as you watch someone inch closer to beating your time, knowing that if they do, you'll have to do even better or die trying. It also makes it easier to watch someone else, and possibly pick up a couple tips for a better time when you have to take the reins again. Also, it's so much more exciting to trash talk when you just smoked someone else's time, and now they have to get back in the seat and try to beat yours. This mode also plays up to 8 players, while split screen maxes out at 4. A final benefit to this mode is you can play with just one controller. The other mode included with the game is a track editor, that lets you design your own masterpieces to race on. It's quite easy to use, but their are some interface problems which prevent it from being as intuitive as it could have been. It's way too easy to accidentally overlap, which erases the previously placed piece, and it's a little cumbersome to use the undo button. With a little time and practice, you can start popping out your own tracks that are just as cool as the official ones. The biggest downside is that many of the pieces in the editor are initially locked, and you must buy them with points earned from the races. As you continue to get medals, additional track parts will become available to buy. I've played for roughly 4-5 hours, have unlocked all the medium difficulty tracks, and there are just a few pieces still unavailable for each environment. In the editor, you're able to place standard track pieces, ramps, speed boosts, loops, banked turns, background objects like rockets or buildings, and more. 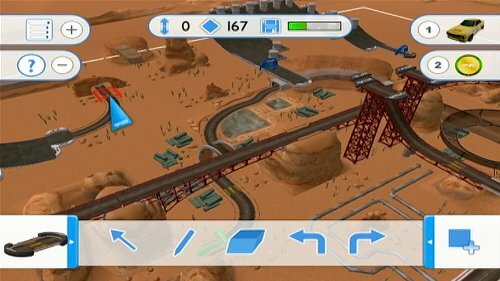 Additionally, you can switch from building a track to testing it instantly with the touch of a button. In fact, it's a pretty cool visual effect to see the game zoom in from the track overview in the build mode to the car view in test mode. 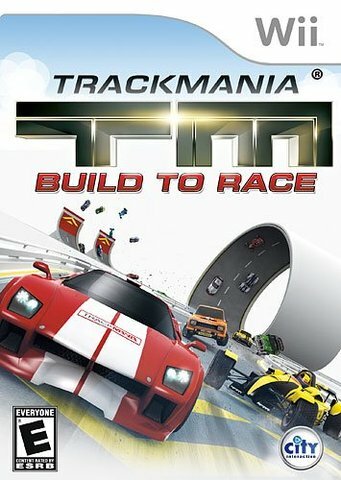 If you are willing to take a chance on the idea that time trials can make for a fun and compelling game, you might just find Trackmania: Build to Race to be one of the best racing experiences the Wii has to offer.